A nice idea, but I don’t think you can beat the personal feeling you get from a real book. I have a Kindle, and for a while I was excited about it, but now I find I have drifted back to books in their original form. It is the optimal manifestation of literature. Thank you for this wonderfully evocative essay on the pleasures of the (physical) text. Perhaps it has something to do with the fact that I am a bibliographer in training (and by inclination), but I find Mr. Parks’ idea of what constitutes reading to be both patronizing and repulsive. That “the essence of the literary experience” inheres solely in reading a string of symbols and decoding them for information strikes me as a dour, almost puritanical conception of what reading is. I suspect that Parks and others like him are gnostics in disguise: they insist that what is truly good and meaningful is only the spirit of the text–its mere capacity to convey information. The flesh we’re better off without. But this, of course, construes reading narrowly. True reading involves reading the manifestation of the artifact in its totality. Reading on a e-reader is still reading, yes, but no one ought to suggest that it’s the same kind of reading as that which a printed book offers. I will always continue to read physical books because they afford me a connection back to the human beings who were involved in its manufacture. I can see their hands, feel their legacies, in the crafted artifact. Sure, the austere pleasure of unmediated information entices certain readers, but I much prefer the humanity of the printed page. Which, I ask, is the more “grown-up” medium, in the end? I am a book fetishist extraordinaire. Page numbers (important to an avid note taker), copyright pages, paper, typography, etc. I love the publishers who indulge fetishists with the name of the type used in printing a specific edition. Some books are so perfectly weighted, typeset, laid-out that you can’t help but feel pleasure opening and yes, reading them. 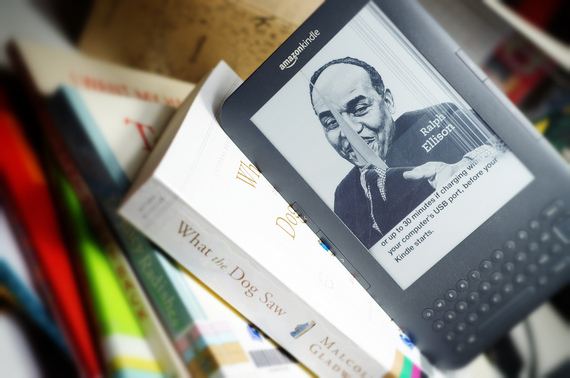 And it’s not only these evocative things that are missing from the Kindle experience but the many other physical intangibles – like having someone comment about the book you’re reading on the train. And don’t get me started on the books that actually require a certain visual sophistication, like graphs and charts, or illustrations. There isn’t any such thing as pure information, though I guess the puritan mindset finds that notion appealing. Count me as a fetishist, no reluctance about it. I’ve been using the Sony Reader for about 75% of my titles for a little over a year now, and I must report, I find this particular device to be very adulteration-friendly. I’ve hundreds of bookmarks, tags, hand-written notes, dictionary search histories, and even a couple digital signatures penned by Rick Bragg and Joyce Carol Oates (whose handler insisted on checking with Ms. Oates personally before allowing me to enter the signing room with no print volume in-hand). I like the way this article explores and expands upon the idea of reading and experiencing literature. I would only add that the gratifications and memories obtained through one’s reading life should survive and evolve through most any medium. Whether I find the story written in the sand by a starving castaway, or have it uploaded into my brain by an alien, if the story is one I connect with, its legacy will inevitably be honored. As for printed books, I side with Mr. Nissley. I like having them around and would very much prefer that they continue to exist. I can remember my mother who was a librarian reading to me as a child. The way she turned a page sounded like a symphony to me. The rub, the turn, the smoothing of pages, the resonant sound the book makes during, the thump on closing, the velum sheet inserted for protection…all of these wonderful bookish qualities cannot be replicated in e-books.